Other than the gift of a great performance the surprise to her guests is that Elen doesn't speak English. Like the singers in Yerevan clubs such as Subway and Bravo where Latino music is performed with an Armenian accent by non-Spanish-speaking musicians, Elen has learned the mood of jazz and lets phonetics take care of the rest. "It is a matter of having a good music ear," she says. "One doesn't have to speak the language." Elen, 24, originally from Vanadzor, is currently a freshman at the State Estrada and Jazz Art College in Yerevan. 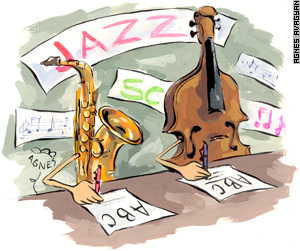 Together with other students Elen is mastering the art of jazz music. For two more years she will study theory and the practical performance of the style. State Estrada and Jazz Art College was established in 1996. The college enrolls more than 100 students, at three levels. Besides the vocal department where Elen studies, there are departments that teach instrumental, modern dance, communication skills and composition. Some courses include the history of culture, style, dance art, musical literature and music grammar. Most of the professors are practitioners and well-known Armenian national musicians and singers, such as Ruben Matevosyan and Robert Amirkhanyan. Aksel Bakunts, a professional musician and the head of the college believes that Armenia has many talented young people and "it is important to build on their natural gift and skills". "The traditions of Jazz music were always prevailing in Armenia than in any other country of former soviet country," says Bakunts. In 1939 the first Jazz Orchestra was founded by Artemi Ayvazyan in Soviet Armenia. "The music they played was not really jazz, but the important thing was the concept of introducing jazz into Armenian cultural life" says Bakunts. State Estrada and Jazz Art College was established by a special decision of the Armenian government to provide professional training to students of arts. A committee comprised of 12 members does the admission to the college. The entering exams include general interview with checking the applicant's IQ, and practical exam (singing, dancing) depending on the specific department to which the applicant is applying. The tuition fee is about $160-200 a year, depending on the department. The vocal department is the most popular and charges the highest fee and has students between the ages of 17 and 25. Elen is a cloth designer who graduated from Vanadzor Design College and later worked for YMCA as a volunteer on cultural events. Now, at quite a different college, she is learning to design songs of Frank Sinatra, Ella Fitzgerald, and Ray Charles, from words she doesn't understand, but a language well known in the universe of jazz.